Love this throw! Longer than most. Heated for cooler weather or in my house low thermostat throw helps for me being cold natured. Also can wrap/hold tight on chronic pain areas and works better than a heating pad because it covers more of body instead of being limited. Highly recommend! Woolrich is an awesome brand! Woolrich Heated Plush to Berber Throw - 60x70"
Woolrich Tasha Oversized to Berber Heated Throw - 60x70"
Immerse yourself in comfort in the Woolrich Heated plush to berber throw. This heated throw utilizes state of the art Secure Comfort heated technology that adjusts the temperature of your blanket based on overall temperature, spot temperatures and the ambient temperature of your room, ensuring a consistent flow of warmth. This unique technology also emits virtually no EMF emissions, so you can snuggle up with confidence. This throw is oversized, nearly a foot larger in the length and width compared to standard heated throws. The ultra soft plush fabric combines with billowy berber in this cozy, comfortable throw. Featuring 3 heat settings, this throw is machine washable for easy care.Includes manufacturer's 5-year warranty. Dimensions 70.0 In. X 60.0 In. X 0.25 In. This heated throw is as soft as a kitten's fur. With the previous heated throws from other brands I needed to set it on high. With the Woolrich heated throw low or medium is enough warmth to keep me comfortable. This is the first review on any product that I have written! This electric throw is soft and plushie like a babies plush toy. You will appreciate the softness against your skin. It's simple. On or off. Low, medium, high. It heats up in about 4 minutes and has a light indicating low, medium, high. The plug is a standard plug two prongs and we'll fit your older plugs. The plug is located about 14 inches from top edge. It is easy to reach yet out of the way. We bought this throw because it was oversized. 60 in by 70in, therefore, it will fit across the top of a regular, queen, king, and as we have, a California king. We use the throw to take the chill off the mattress and warm the covers before we get into bed. Since we have wool comforters we normally turn it off when we retire. The wires are really thin and hardly noticeable. There are no EMF emissions and it is washable. The best part was the price and the fact that it has a 5 year warranty. We have purchased three different throws in the last year that have decided that they didn't need to work past few months. We are hopeful that we will have better success with this lovely item. This may be what you are looking for to fit your budget and keep you cozy. I can’t go through winter without my heated throw .. I got the tan one and it’s soft and plush . I had a throw but it kept disconnecting from blanket !! You can’t go wrong on the quality of this brand . This heated throw is great. It works well and the color is exactly as described. This heated throw is amazing for the price. The 3 heat settings allow you to pick the perfect setting to warm up on a cooler fall day. The throw its self is extremely soft and could be confused for just a regular plush blanket if it weren't for the remote (Which is removable which is nice because it allows the blanket to be used independently). I would highly recommend this product to anyone who gets cold easily during the winter or anytime of year. 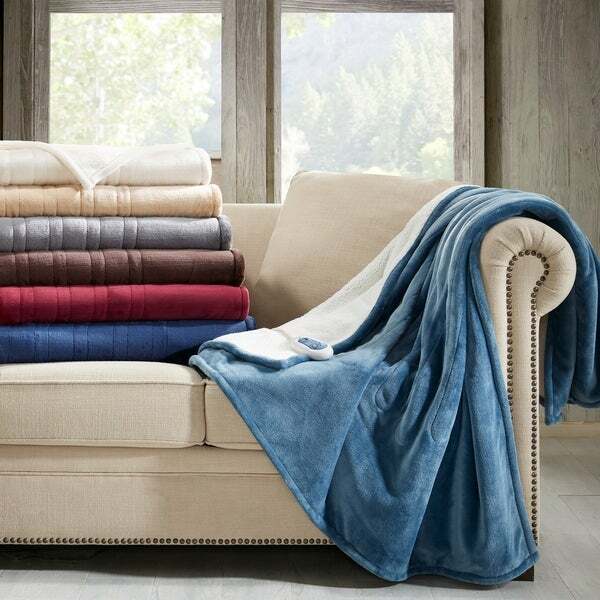 Love this Woolrich Heated Plush Throw. So soft, and the heat settings work great. The color is as shown in the picture. I always keep a throw on my sofa, this one is staying. We have always had electric blankets, we used to live in Canada. I would say we are electric blanket experts. There are really only 2 things that can screw up a heated blanket. If it's too small and if it doesn't get warm enough. Well i can tell you that this blanket doesn't have those issues. It's big, I'm 6'3 and i can cuddle this blanket! and the thing gets hot too, a nice radiant heat that gets right into you. I've fallen asleep a few times on the chair with this blanket and I have no worries. Its clearly well made and the electronics part looks and feels top notch. This also is the most expensive heated throw we have ever had, for us it is worth the money for sure. It's soft too, some of our other electric blankets were not, and some are stiff even. Not this one. Its a good blanket, I would tell my family to get one. I have enjoyed this throw because of its larger size and the great heating ability. It does warm up well and keep you cozy. It has an automatic shut off of 2 hours which works nicely in the evening while watching television. I even share this throw with my hubby when it makes me too warm! He doesn't warm up quickly so he ends up using it more than I do! I would recommend this throw especially for cold blooded folks! I ordered this blanket for my daughter because she asked for a super soft throw. This fit the bill. It is so soft on both sides and a nice pattern. She loved it so much my older daughter fell in love with it and we have recently purchased a second one. The woolrich throw is nice feeling, a very nice blanket/throw overall. What was BAD about it is that the description does not tell you that it turns off in 2 hours. I also ordered it for my condo out of state and did not try it until warranty expired. I know it is not meant to be an overnight blanket, but the ad on overstock did NOT say it turns off in 2 hours. But it did say it on the front of the package when I received in mail. The Biddefords give you 10 hours and I use mine as an overnight blanket. This was a great throw for the two months that it heated. I am sick and tired of heated blankets that don’t heat. They are useless when they quit working because the wires don’t feel that great in the first place. So to the trash heap they go!!! This is a beautiful blanket and better made than most. I had bought it for a Christmas for my roommate who is always cold and loves heated blankets. The one she had looked dangerous as the cord was so linked up. When she was so sore with arthritis that she hadn’t slept for 3 nights, she was going to try to sleep in her recliner with that awful, scary blanket that I thought was a fire hazard. I asked her if she wanted a Christmas present early. She looked at me strange and I brought it out. She absolutely loved it. It is warm and safe (shuts itself off in 2 hrs. ), and sooo soft and plush. She slept well with it and loves the blanket. We would give it 10 stars if we could. We just recently received our blankets. They are extremely soft and comfortable. I ordered denim color but they ended up being Navy. They are still pretty. The tan are very pretty as well. My sons are using them as I type this. They love snuggling up and these are a perfect early Christmas present. As to the durability, we cannot say at this time. These do need to be washed on extremely gently wash with very little soap. Tumble dry on air for 5 minutes then spread out to finishing drying. To avoid damage to the heating elements of the blanket. This blanket seems nice, however I never ordered it. They heat well enough. But the material was not the best. It tore along one of the seams in the first month. I returned mine for credit. So disappointed! I purchased this for my mom for Christmas-she loved it until it just stopped working! She's only used it for a few months! Now I have to contact the manufacturer and hope for the best. I expected better at this price point. Bought it for my daughter and she loves it. She can take it from bed to the couch. This throw was a gift for my cold natured daughter. She really likes it and told me her son loves it too. I guess I will be getting him one this Christmas! This blanket is beautiful, large and comfy. My only complaint is I wish it got a little warmer, but I am always cold, so there is that. Of all the blankets I have tried, this one does get the warmest. "Is it cordless? I am looking for a blanket that you don't have to plug in." Negligible EMF's, Extra size and color selection. "One reviewer reported that this throw only stays on for one hour! Is this true?" I bought this throw last fall. I never had problems with it "turning off" after one hour. I used it during the winter months, even taking it with me to bed one night. An electric blanket can be a cozy solution for the winter cold or just a convenient addition to your bedding. Find the perfect heated blanket for you. Beautyrest Heated Plush Oversized Throw - 60x70"
Beautyrest Oversized Heated Ogee Throw - 60x70"